UNITED NATIONS, March 24 -- Amid calls to refer the military government of Myanmar to the International Criminal Court, like Sudan was referred, UK Ambassador Mark Lyall Grant told the Press on Wednesday that his country would support such a referral. But, he said, the Security Council lacks the unanimity necessary for such a referral. Video here. Inner City Press asked China's new Ambassador to the UN Li Baodong what his country thinks of the Council discussing Myanmar's election laws. "General elections in a country is a matter of sovereign states," he replied, "and should be respected." This principle, he said, applies to Myanmar. Video here, from Minute 2:50. But when Secretary General Ban Ki-moon addressed the media, Inner City Press asked him about Aung San Suu Kyi's call on her National League for Democracy to not register for the upcoming elections, given how flawed the election laws are. 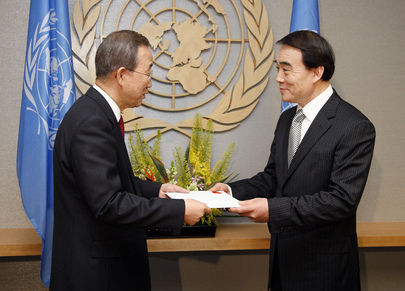 "Let me answer tomorrow afternoon," Ban Ki-moon told Inner City Press. Video here from Minute 7:34, UN transcript below. There will be a meeting of Ban's Group of Friends on Myanmar, to be addressed by Ban's chief of staff Vijay Nambiar. We'll be there. 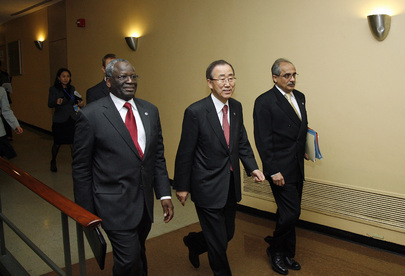 Footnotes: On March 23, Inner City Press asked Ban's spokesman to confirm or deny that Ban proposed a former Indonesian foreign minister to replace Ibrahim Gambari as his envoy to Myanmar, but that Than Shwe vetoed it. Nesirky said, "that's the first I hear of it," despite the report being included in an article Nesirky said was the only story alleging that Nambiar secretly traveled to Myanmar earlier this year. Inner City Press asked the UK's Lyall Grant if the UK believe that a permanent replaced for Gambari should be named. His reply noted that Nambiar is only in the position on an "interim" basis. As Inner City Press has previously reported, the U.S. has said it prefers not naming a permanent replacement until after the elections, so that the person is "not stained" by the elections.